The set of hotel management applications is fully modular and scalable. Our client hotels receive tailor-made packages and subscription services according to their exact needs and specific preferences at any given time. There are hundreds of other unique features in our Hotel Management Optima Line that you will not find in any other similar application. Each one of them was developed with awareness of the needs of the hotel staff, management and owners. Optima PMS is a state of the art; Windows based Property Management System that incorporates the latest in advanced technology. It is designed to provide all the features of a sophisticated Front Office system linked with other computerized hotel applications on one relational SQL database. Optima enables maximum performance, utilizing the latest in both Client-Server and thin client technology. Together with the use of a modern GUI it offers the ultimate system for any Front Desk. Optima is a most powerful and advanced Front Office system based on years of experience and on highly sophisticated development and focus teams, including superior hoteliers, engineers and front office specialists. These teams have researched and 'brainstormed' to meet the highest standards of the hospitality industry for the next century. The Multi PMS program is a unique system that combines PMS of number of hotels under one leading system and is ideal to small and medium hotel chains that do not wish to invest in large, complicated and expensive central reservation systems. Multi PMS allows the user to view the occupancy of all the hotels in the group at one glance and access each and every hotel easily. A direct access is available to any specific hotel new FIT reservation, new group reservation, monthly availability, search reservation, price quotation and the main menu (depending on security levels). The main window lists all the hotels and shows their daily availability for the next 10 days. The user can scroll to the next 10 days or jump to any given date the same way as in the standard hotel availability window. By pressing a button the user can view the hotel's availability by room categories and types and quickly view the same information of a different hotel. The daily comments are shown for every hotel plus global daily selling instruction for the chain. Optima offers two type of central reservations. The Multi PMS, ideal for centrally managed hotel groups and the CRS, ideal for a group of hotels that are not centrally managed or are running on local servers in the individual hotels. Seamless integration between the CRS and the PMS allows the CRS to compete on the last room and assist the hotels in filling up at the current effective price. 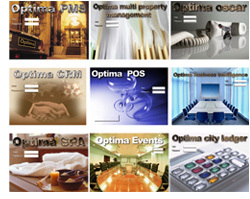 Optima Software offers the latest concept in hotel chain management that puts hotel chains on the top of the world standards of hotel technology and operations. The concept is base on the idea of centralizing information and computer resources in order to improve significant selling processes and the control over all processes run in the hotels. Optima hotel chains solution calls for purchase of licenses for the complete Optima line of chain property management systems, including the Front Office Management Systems (PMS) and Multi Property Management System (MPMS), CRS, back office ERP (central accounting, stocks and purchasing), point of sales, guest care center and event and catering management, for a group of hotels and access for hundreds of employees and staff of the chain. The range of software solutions is enterprise wide, covering front and back office chain wide and property specific purchasing and inventory management. Optima Application Service Provider (ASP) for the Hotel and Hospitality Industry was introduced to the hotel and hospitality industry in 1998, targeting small and medium size independent hotel groups and hotels. The rising cost of IT implementation and the constantly increasing cost of IT administration in its client hotels was the impetus for creating the Optima ASP product. This market segment of hotels has been seriously burdened by the constant upgrading of hardware, software, as well as the difficulties having to manage ever-increasing complex systems. The Optima YHMS is a system specially designed to centrally manage Youth Hostels Associations. The system uses one single central database that serves the activities of the whole associations. Technically, it is a multi-tier application running from a central server. Users are using thin clients, connected to the center using phone lines or the Internet and will never need technical support and maintenance (zero client administration).